Christine Rhyner is an adoption advocate, mother to two internationally adopted children and a Christian "work in progress." 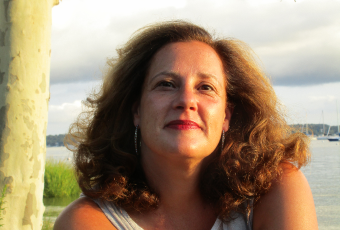 She writes about infertility, reproductive technologies, adoption and personal experience. 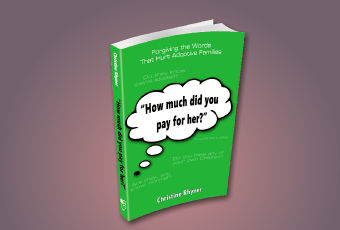 Her debut book, "How much did you pay for her? Read about Christine's Journey: I love to write nonfiction because people are always curious, seeking...and struggling as they open the doors life presents to them. It is my passion to examine God's word and allow the Holy Spirit to illuminate its meaning and application to daily life in my work. How Much Did You Pay For Her? Understanding why people say what they do is the first step toward compassion, as it allows us to glimpse another s perspective. This can lead to giving others grace an undeserved gift of letting people off the hook for what they say that eventually leads us to forgive them. When I listen to politicians and pundits speak of values I’m left with an unsettled sense that we are supposed to understand what this means, but it’s not possible. Admittedly, I cannot because it seems that values are abstract perceptions of reality that America is in rancorous disagreement over. Moral relativism and political correctness having taken over large swaths of our society. So just what are our values anymore? I value the sanctity of life from conception, while some of those close to me say they value a woman’s right to choose. I value our nation built on Judeo-Christianity stemming back to a Constitution I believe before written was bathed in prayer to the God of the Christian Bible. There are Christians I know that, despite the firm Christian roots of our Constitution, believe it should guarantee us freedom from religion. Despite believing in a Bible that tells us that “there is no other way to the Father except through Jesus Christ,” they find it reprehensible to question the validity of another’s religious beliefs and that essentially all roads lead to Rome—or heaven. This is why I was particularly struck by an interview with a Swedish journalist on a cable news program soon after the recent terrorist attack in that country. She said that a lack of values in her country was making room for Isis to fill the void. A highly secular nation has found itself pitted against those with a strong sense of their own values—barbaric as they may be—a strong national identity and unwavering dedication to their religious beliefs. This got me thinking how our own ever-increasing secularism, lack of pride in our own national identity bordering on hatred for this country, increasing disrespect for authority, globalism and increasing multiculturalism with isolated enclaves of refugees and migrants all works against a nation that has been exceptional. 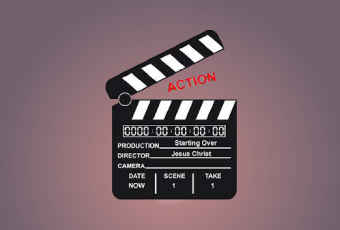 For there was a time not too long ago when our so-called value system stemmed from our Judeo-Christian ethic. I believe that an acceptance of all ideologies, all morality as equally valid, erodes a nation’s fabric and national identity leaving a void that those as motivated and extreme in their cause will fill. Our Constitution in its original context and purity—not an evolving document as some would have it to be—and our Judeo-Christian heritage made America exceptional, special, united and more cohesive in just what values constitute. And I think that the farther a nation tilts itself away from these very roots, the more danger it is in to succeed and thrive. In my eyes, the divisiveness in our nation, the anger, the hatred for a new administration, the polarized perceptions of just what is reality by the media and downright warring between and among political parties all seem to bear this out. A multi-ethnic country of varying religious beliefs can and does work. But one steeped in multiculturalism, moral relativism, political correctness and secularism cannot. We are in a war for the very soul of our nation and in fact the globe is on fire for lack of united and cohesive values. The big truth is that while we tout values as important and noble to us as a nation, we are completely schizophrenic in our assessments of just what they represent. We lack understanding of the power we have through Christ to wage battle and bring defeat to the enemies that are tearing apart our country. If only we were to turn to Him, humble ourselves, confess our sins and unite as people of one faith, not multiple values, we could make an enormous difference in the war on terror. But then this would mean that America would experience a great Spiritual awakening, revival and large numbers of people would receive Christ as Lord and Savior. Though this is my ongoing prayer for this country, America is not and perhaps will never be a predominantly Christian nation. But left to its own subjective devices, a country that becomes more alienated from one another in sharp disagreement over just what is good and right and true is not destined for peace and unity.